The Colegio Internacional Alicante is a small modern centre, perfectly equipped, and situated in Alicante’s largest commercial district, just ten minutes from the Mediterranean sea and its fantastic beaches. The teachers are university graduates and are associated in a cooperative with extensive experience in teaching Spanish as a foreign language. Furthermore, in the Colegio Internacional de Alicante, the staff interacts with the students creating a young, dynamic and friendly atmosphere; this way, students begin to communicate from the first day. Their teaching method is totally active and communicative, based in the participation of students. Thus, not only grammar is learned, but how to function in real life. 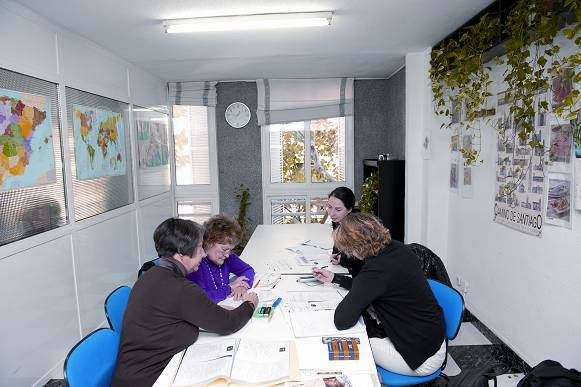 In addition to offering standard courses, they also have private Spanish classes for business and classes tailored to the needs of the student or group. With a great value for money, at the Colegio Internacional Alicante students may also enjoy a full program of cultural activities: guided visits to places of interest, excursions to towns and villages near Alicante, sports, films in Spanish, etc. All of it designed to make learning Spanish a fun and enriching experience. Activities: tourism, arts and leisure. Intensive Spanish Course: twenty hours of lessons a week and with four levels. Culture or conversation course: 25 hours of lessons a week; intensive course plus an introduction to Hispanic culture (history, literature, economics, art, etc.) or an extra hour of conversation. Preparation course for the DELE (Diploma in Spanish as a Foreign Language): course designed to prepare students wishing to take the D.E.L.E. exam, of the Spanish Ministry of Education and Science and the Instituto Cervantes. Recommended for students of intermediate or upper level. Hispanic Course: 25 hours of lessons a week for twelve weeks. Includes the intensive course and one hour of culture or conversation. Individual Course: course designed to be adapted to the needs of each student. May be of 20, 25 or 30 hours of lessons a week. Combined Course: 25 or 30 hours of lessons a week. Intensive course plus 5/10 individual hours a week. Group Course: for retired people, teenagers, professionals, etc. Course duration, timetables and subject matter are adapted to the interests of the group. Includes programme of activities and visits. The centre offers accommodation in families or in shared apartments with single or double room. Accommodation with Spanish family: with this option, the student has the opportunity to participate in the daily life and customs of a Spanish family. You can have a single room with half or full board, or a double room, with half or full board. Shared apartment, self-catering: with this option the student shares an apartment with other foreign students. The apartments are comfortable, basically furnished, located nearby for easy movement, and have single and double rooms. The apartments and families have been carefully selected and are visited regularly for proper operation by school personnel. The school also helps to look for accommodation in guest houses or hotels. The Colegio Internacional Alicante organises guided visits to museums, monuments and places of tourist interest within the city, as well as a welcoming party and another of farewell. It also offers excursions and visits every Saturday to cities close to Alicante like Altea, Elx, Calpe, Guadalest, Benidorm or Valencia, to get an indepth knowledge of the Region of Valencia.